But there are ways to get in a workout near some big name beasts without fear of being mauled. 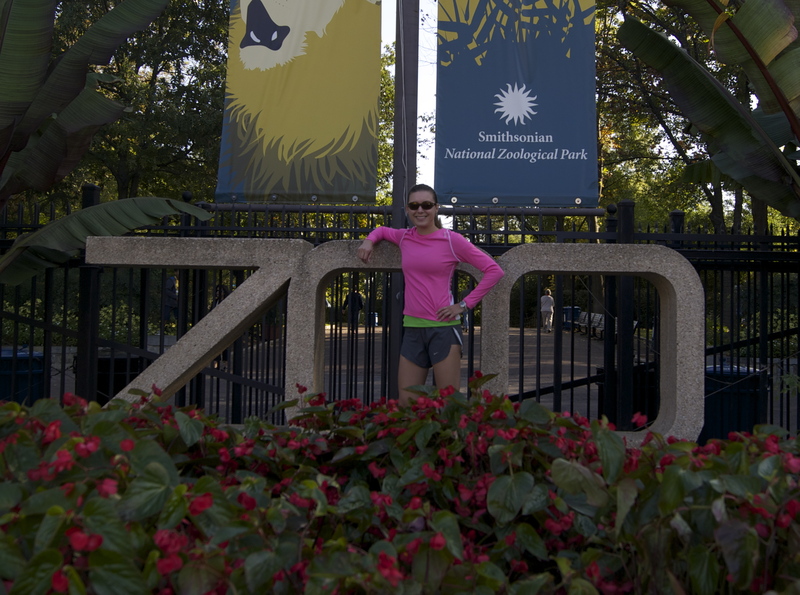 Running through the National Zoo in Washington, D.C. comes to mind. I did just that last Sunday when I traveled to the DC area to hang with Baby Sister. After checking out a few routes on MapMyRun.com that incorporated the winding-trails of the animal park, we set out on our urban safari. Baby Sister isn’t much of a runner, so I left her in charge of the camera and trotted ahead. Skip the concession stand. When I don’t feel like carrying a water bottle, I’ll slip an Abraham Lincoln in my pocket and stop somewhere to buy a beverage. But with plenty of drinking fountains sprinkled throughout the Zoo you can save your cash. Go early to beat the crowds. Baby Sister and I entered the park around 9:45am, and by the time we left the place was swarming with strollers and herds of tourists. Remember what they say about early birds, they get to see the animals play before taking their mid-day siestas.